I haven’t been paying much attention to NASA’s current Saturn mission, but I should be. Even after the Huygens landing, there’s still a lot of amazing science — and photography — coming out of Cassini as it swoops through Saturn’s rings and moons. Right now Cassini is starting an extensive survey of the rings, and has confirmed that the rocky moon Phoebe is closely related to Kuiper Belt Objects. 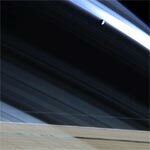 Mimas against Saturn’s blue-tinged, ring-shadowed northern hemisphere. Titan’s hazy upper atmosphere in natural color. And speaking of Mars Rovers, Opportunity is set to try getting unstuck from the deep sand it’s currently bogged down in. Best of luck to the JPL rover team on that.